A fun action comedy that most anime fans should enjoy. It is about a girl (Index) who has memorized thousands of prohibited magical books and has escaped from the Church of England. She is found and protected by the main character (Touma) who has the ability to neutralize any magic or ability with his right arm. Set in an academic city of "Science" (Mostly telekinetic type superpowers), magic is starting to invade behind the scenes, mostly hunting after Index. When these two worlds collide, trouble comes early and often. It is an exciting show, with a bit of a tilt towards the Harem genre. There is a lot of violence in this series, so if you are looking for clean fights, forget about it. Never before have I seen so much violence inflicted on young teenage girls... with them receiving more than their fair share of uppercuts, hooks, gut punches, and being left on the ground for dead this show can be pretty disturbing if you have never watched anime before. The good thing is that these poor girls are either bad and really deserve what they get, or are good and it is used to drive the plot. As it originates from a book, there is not really a lot of catering to Moe stereotypes, and most characters tend to be pretty well developed. That is not to say they aren't there, the story just doesn't revolve around it. Also, there is a Side-Series called "A Certain Scientific Railgun". They both take place at the same time and fill in story gaps that are missing in the other. The main character in one, is an important, but secondary character in the other. Though A Certain Magical Index aired first, timeline-wise, A Certain Scientific Railgun starts first, and A Certain Magical Index ends last. Also Railgun sticks exclusively to the scientific side and thus sets up the known world very well, while Index adds the magic as something new and exotic to the world. Because of this, I would highly recommend watching Railgun before watching Index. Overall it is a fun show to watch with rarely a dull moment. I would highly recommend watching it. This is the show that started it all. True its not as good as its spin off, Railgun, but it still has its moments.The main characters are sometimes eclipsed by the side characters. Which is the reason for the spin off. Overall its a pretty decent anime. Just because its not a good as Railgun does not mean this is not a 5. It is capable of standing on its own. The second season is where this anime shines. Not as good as the 2nd season but still fantastic. While i personally enjoyed the 2nd season more this first season was still a treat to watch, especially the sisters arc which was tolled and explored better in railgun but index 1 is still a great entrance way into the a certain franchise. Probably my biggest problem with this show is the rehashing of plot elements which does stop towards the end of index 2. While index 2 and railgun are better series index 1 still serves as an excellent introduction to academy city and all its characters. Touma is a just man, he fights for equality, true equality. He doesn't care whether you are a man or a woman, whether you're young or elderly, whether you're an edgy teen or an absolute thot. Touma is the hero we need but not the one we deserve. TOUMA PUNCH MAGIC OUT OF MAGIC MAN. Despite the not so interesting plot and overall storyline I honestly prefer this over Railgun. Railgun kind of feels like a filler series to me but I suppose it's because I watched this first. Index is annoying but I like Toma and I like Misaka's character in this series because of the interactions she has with Toma. I wouldn't go as far as to give it a 5/5 but it definitely isn't that bad and the dub is pretty fantastic. I had stopped watching anime up until a few years ago and this anime's release got me back into it so maybe I'm bias. But i would give it a shot if you liked Railgun you might like this more; like me. 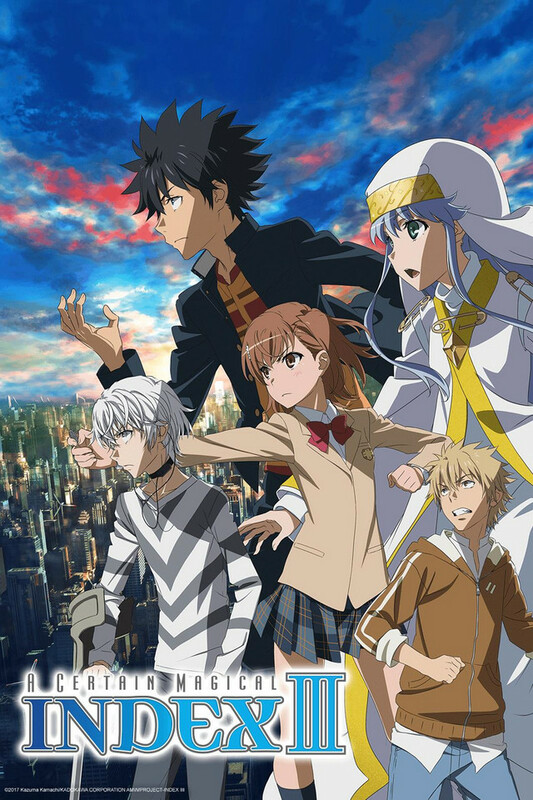 A Certain Magical Index takes place in a world where supernatural abilities are commonplace. The world is divided between science and magic. The protagonist lives in Academy City where students are trained to scientifically develop latent abilities and become espers. Each esper has a single ability (like teleportation) and a corresponding level indicating how powerful that ability is. The people living and working in Academy City are unaware that magic is real, and the characters who can use magic distrust science and have generally poor reasoning skills, to the degree that it actually factors heavily in to some plots. The protagonist is special: his right hand can negate any supernatural phenomenon. I really liked the premise of the series and I would give it a favorable recommendation. Having said that, some of the arcs in Index feel very slow, and it is one of those shows that gets frustrating from time to time because the obvious thing to do is something the characters either never try or take ages to get to. Sometimes technobable is thrown out or deeper lore that never appears in the shows is foreshadowed. For those of you who have seen A Certain Scientific Railgun, Index is basically its more plot-focused twin. And it stars Touma instead of Mikoto. If you like one you'll probably like the other. I would normally give this anime 4 stars, but I feel like some of the others are being a little unfair in their reviews. I've never seen railgun, so I went into this anime without any sort of preexisting bias. I'm only on episode 12, but have found it highly enjoyable so far: it definitely stands on its own as an anime. The show is very formulaic (loser student hero with secret power). That said a lot of the background story of the setting is useful and will add to your experience when you move on to watching the spin-offs Railgun and Accelerator. And for a pleasant diversion the series is worth watching since it does have decent production quality and does throw in a bit of slice of life humor.